Starting Material: 1–5 μg of fragmented DNA. Vortex AMPure XP beads to resuspend. Add 160 μl (1.6X) of resuspended AMPure XP Beads to the ligation reaction. Mix thoroughly on a vortex mixer or by pipetting up and down at least 10 times. Put the tube/PCR plate on an appropriate magnetic stand to separate beads from supernatant. After the solution is clear (about 5 minutes), carefully remove and discard the supernatant. Be careful not to disturb the beads that contain the DNA targets. Add 200 μl of 80% freshly prepared ethanol to the tube/PCR plate while in the magnetic stand. Incubate at room temperature for 30 seconds, and then carefully remove and discard the supernatant. Air dry beads for up to 5 minutes while the tube/PCR plate is on the magnetic stand with the lid open. Remove the tube/plate from the magnet. Elute the DNA target from the beads by adding 47 μl of 10 mM Tris-HCl or 0.1X TE. Mix well on a vortex mixer or by pipetting up and down 10 times and incubate for 2 minutes at room temperature. Put the tube/PCR plate in the magnetic stand until the solution is clear. Without disturbing the bead pellet, carefully transfer 42 μl of the supernatant to a fresh, sterile microfuge tube. Incubate in a thermal cycler for 30 minutes at 37°C. Add 90 μl (1.8X) of resuspended AMPure XP Beads to the ligation reaction. Mix thoroughly on a vortex mixer or by pipetting up and down at least 10 times. Remove the tube/plate from the magnet. Elute the DNA target from the beads by adding 30 μl of 10 mM Tris-HCl or 0.1X TE. Put the tube/PCR plate in the magnetic stand until the solution is clear. Without disturbing the bead pellet, carefully transfer 25 μl of the supernatant to a fresh, sterile microfuge tube. *The NEBNext adaptor is provided in NEBNext Oligo kits. NEB has several oligo kit options, which are supplied separately from the library prep kit. Add 3 μl of (red) USER™ Enzyme Mix by pipetting up and down 10 times, and incubate at 37°C for 15 minutes. Note: This step is only required for use with NEBNext Adaptors. USER™ enzyme can be found in the NEBNext Singleplex or Multiplex Oligos for Illumina. Add 90 μl of resuspended AMPure XP Beads to the ligation reaction (~53 μl). Mix thoroughly on a vortex mixer or by pipetting up and down at least 10 times. Remove the tube/plate from the magnet. Elute the DNA target by adding 105 μl of 10 mM Tris-HCl or 0.1 X TE to the beads for bead-based size selection. Note: For size selection using E-Gel size select gels or standard 2% agarose gels, elute the DNA target at desired volume. Put the tube/PCR plate in the magnetic stand until the solution is clear. Transfer 100 μl of supernatant (or desired volume) to a new tube/well, and proceed to bead based size selection. Table: Recommended conditions for dual bead-based size selection. The following size selection protocol is for libraries with 200 bp inserts only. For libraries with different size fragment inserts, please optimize bead: DNA ratio according to Table 1.1 above. Add 80 μl (0.8X) resuspended AMPure XP beads to 100 μl DNA solution. Mix well on a vortex mixer or by gently pipetting up and down at least 10 times. Place the tube/pcr plate on an appropriate magnetic stand to separate beads from supernatant. After the solution is clear (about 5 minutes), carefully transfer the supernatant to a new tube/well (Caution: do not discard the supernatant). Discard beads that contain the large fragments. Add 20 μl (0.2X) resuspended AMPure XP Beads to the supernatant, mix well and incubate for 5 minutes at room temperature. Put the tube/PCR plate on an appropriate magnetic stand to separate beads from supernatant. After the solution is clear (about 5 minutes), carefully remove and discard the supernatant. Be careful not to disturb the beads that contain DNA targets (Caution: do not discard beads). Add 200 μl of freshly prepared 80% ethanol to the tube/PCR plate while in the magnetic stand. Incubate at room temperature for 30 seconds, and then carefully remove and discard the supernatant. Remove the tube/plate from the magnet. Elute DNA target from the beads by adding 17 μl 10 mM Tris-HCl or 0.1X TE. Put the tube/PCR plate in the magnetic stand until the solution is clear. Without disturbing the bead pellet, carefully transfer 15 μl of the supernatant to a clean PCR tube and proceed to enrichment. Use Option B for any NEBNext oligos kit where index primers are supplied in a 96-well format. These kits have the forward and reverse (i7 and i5) primers combined. *NEBNext Oligos must be purchased separately from the library prep kit. Refer to the corresponded NEBNext Oligo kit manual for determining valid barcode combinations. **Use only one i7 primer per sample. Use only one i5 (or the universal primer for single index kits) per sample. * If library construction was performed with 5 μg of starting material, use 2–4 cycles of amplification. If starting material was 1 μg, use 4 cycles of amplification. However, optimization of PCR cycle number may be required to avoid over-amplification. Vortex Agencourt AMPure XP Beads to resuspend. 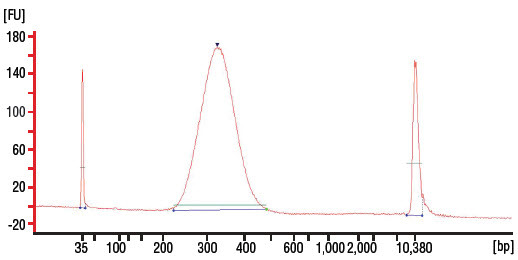 Add 45 μl (0.9X) of resuspended AMPure XP Beads to the PCR reactions (~50 μl). Mix well on a vortex mixer or by pipetting up and down at least 10 times. Air dry the beads for 5 minutes while the tube/PCR plate is on the magnetic stand with the lid open. Remove the tube/plate from the magnet. Elute the DNA target from the beads by adding 30 μl of 0.1X TE. Put the tube/PCR plate in the magnetic stand until the solution is clear. Without disturbing the bead pellet, carefully transfer 25 μl of the supernatant to a clean LoBind® (Eppendorf AG) tube. Libraries can be stored at –20°C. Dilute 2–3 μl of the library 20 fold with 10 mM Tris-HCl or 0.1X TE and assess the library quality on a Bioanalyzer® (Agilent Technologies, Inc.) high sensitivity chip. Check that the electropherogram shows a narrow distribution with a peak size approximately 300–320 bp. Example of DNA library size distribution on a Bioanalyzer.